Home / Blog / What A Great Ending to the Year! What A Great Ending to the Year! What an absolutely phenomenal way to end the golf season. While there’s still some tournaments we may have betting tips in for 2016 – we might also be done until the New Year. We’ll be sure to analyze tournaments like the Hero World Challenge and Franklin Templeton Shootout of course. But honestly – we’re quite happy to sit back an bask in the glory of what an ending to the year it was. What an absolutely great ending to the golf season. And if you’ve been following us on a regular basis you’ll know that those aren’t even the biggest wins we’ve had. 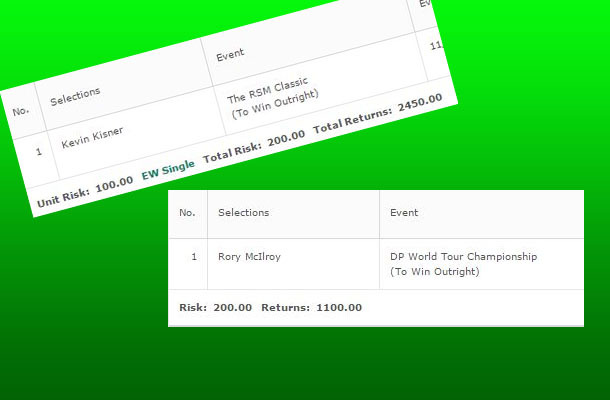 Hopefully you have enjoyed this golf season – all of the free betting tips, and all of the free money. I’ve had a lot of fun doing it and although it wears on us occassionally – it’s been a blast, and a very profitable golf season. Like we said there are some tournaments we’ll look at but it’s very likely we’ll take December off to refresh our batteries. In the meantime if you’re looking for sports betting tips to keep you going be sure to check out our free NHL betting tips website. Have a good one guys and thanks for following us.